‘Sue’ sure gets thrown around a lot these days. The word simultaneously drums up images of those boldly blustering threats in a retail establishment and reports of fraudulent lawsuits featured on 24 hour news networks. Sue certainly does not have the best reputation, and, though it may be tough to imagine, there may come a time when even the most court-averse of us find the word in our vocabulary. Surprisingly, the word sue does not stem from a slang version of ‘lawsuit,’ or even ‘suit,’ it instead stems from a long standing and evolving European term that means roughly “to pursue.” If we think of sue as pursue, it suddenly doesn’t seem quite as condemnable. We associate pursuit with far more endearing concepts than money extraction via court; pursuit draws up imagery of hunters stalking prey for food, good samaritans chasing down a bag snatcher, or the police chasing OJ on his flight to Mexico. Pursuit represents justice, it represents survival, and it represents refusing to break under the pressures the world places upon us. Civil litigation can be seen from this new guise as well: a pursuit. If you are pursuing justice and refusing to be unheard, suddenly sue just doesn’t quite cover the depth of your pursuit. Unlike hunting or chasing down a bag snatcher, legal pursuit is not the kind of thing that should, or even usually can, be done without proper counsel. It is essential to seek a skilled litigation attorney prior to pursuing, or even engaging with, the party that wronged you. Often times, the most important part of any civil suit is the analyzing and planning that happens long before a court hears the case. 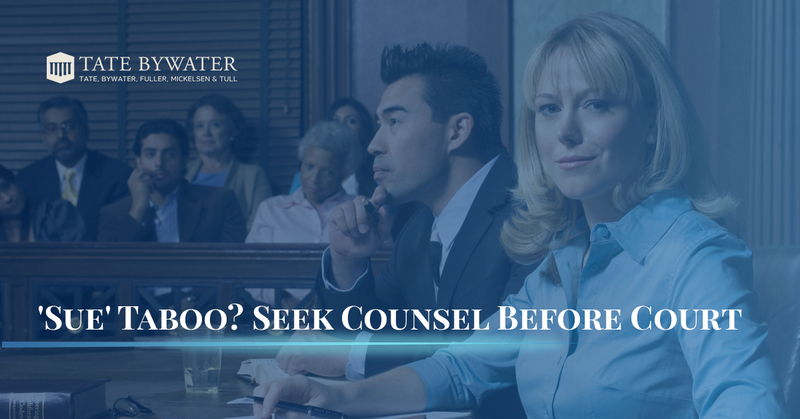 Before you threaten to sue, or allow yourself to be scared out of doing so by the perceived severity of the word, contact Tate Bywater for expert legal counsel, and eventual representation. We help to navigate the entire process, especially in the crucial early stages of analyzing, planning, and communicating with the party that wronged you. Our team of expert civil litigation attorneys have been serving the Greater Fairfax and Prince William county area from our main office in Vienna for over 40 years. Our attorneys have the expertise necessary to properly navigate your pursuit, as we specialize in both intense legal action and skilled tabletalk necessary to bring any case to the swiftest close, with prime results for those we represent. Ask us to lead your pursuit today!